Checkout 51: New Money Making App! You are here: Home / Finance / Checkout 51: New Money Making App! Here’s a new app to help you earn money back on your normal shopping! It’s much like Ibotta, it’s called Checkout 51 and just went live recently. They are calling today their “launch”. they are out of Canada and it’s been available there and now they are opening up to the US! 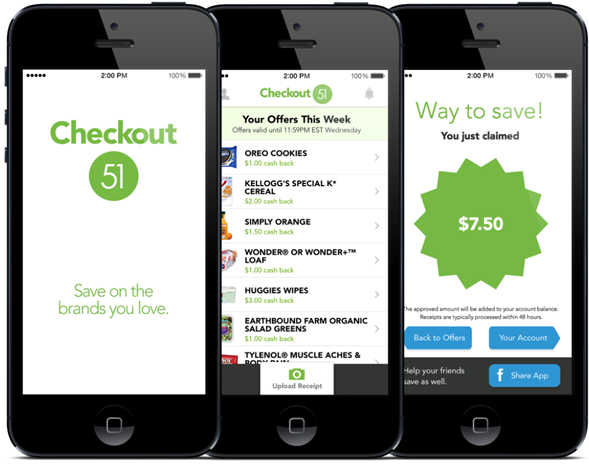 Checkout 51 is Canada’s hottest grocery savings app that is now launching in the US. Get new offers weekly, buy from any store, snap a photo of the receipt, and get cash back! 1. Buy items from the Offer List at any store. 2. Upload a photo of your entire receipt using the app or website. 3. Get cash back – Checkout 51 will confirm your purchase, credit your account, and you can cash out when your account reaches $20. * New offers every Thursday. Items must be purchased and receipt must be uploaded within the valid date range. Do I have to do anything to “earn” my offers? Nope. Just go to any store, buy the products on offer, and upload a photo of your receipt. It’s that simple. Where do I get Checkout 51? The mobile app is available in the App Store and on Google Play. If you don’t have a smartphone, tablet, or iPod Touch with a camera, you can use Checkout 51 online here. Yes! We’re the #1 grocery savings app in Canada, listed by the Canadian App Store on their “Best of 2013” list. In the last year, Canadians have saved more than $2,300,000, and Canada is only 10% the size of the US. Well, there you – you can get started right away! This one will definitely go on my list of Favorite Money Saving Apps! While you’re getting this app on your phone don’t forget to get the Grocery Shop For FREE app, too! Great idea! Excited for this new opportunity to earn some extra spending money! Wonderful way to make some extra spending cash!